Origin: Delta Quadrant. A cybernetic life-form thousands of years old which is part organic, part artificial life. They have advanced well beyond Federation science, unknown prior to a confrontation with the U.S.S. Enterprise NCC-1701-D arranged by the entity known as “Q” circa stardate 42761 ( 2365) some 7,000 light-years past explored Federation space in the Delta Quadrant. 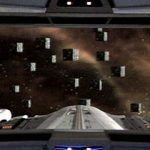 borg ships & voyagerThe Borg have a singular goal, namely the consumption of technology, rather than wealth or political expansion as most species seek. According to their spokesman, in the form of an assimilated Captain Jean-Luc Picard, the Borg only want to “raise the quality of life” of the species they “assimilate.” Androids, for example, they view as primitive and obsolete. 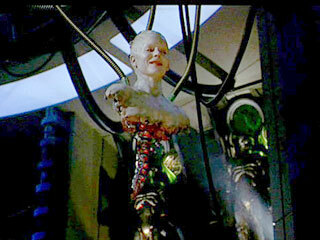 Born humanoid, they are almost immediately implanted with bio-chips that link their brains to a collective consciousness via a unique subspace frequency emitted by each drone. This collective consciousness is experienced by the Borg as “thousands” of voices — they are collectively aware, but not aware of themselves as separate individuals. Consequently, they never speak in singular pronouns, referring to themselves when required as merely “Third of Five,” for instance. The Borg ingest only energy to drive their technological system via an energy conduit port. Their bio-chips synthesize any organic nutrients needed. 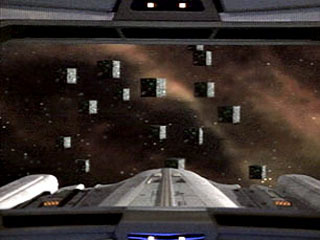 Among the many advantages their collective consciousness affords them, the Borg hive-mind allows for instantaneous adaptations to shield and phaser frequency modulations in combat; they are also able to regenerate and repair their massive cube ship with the power of their collective thoughts alone. The hive-mind drones do not register as individual life-signs when scanned, only as a mass reading and then at a bare minimum. The sick and injured are not healed but “reabsorbed” by the removal of the receiver piece, which leads to self-destructive dissolve. When shipboard during dormancy in their regenerative mode, power is minimal and the vessel’s EM field cuts off. They have a knock-out drug or procedure for humans, using a drill-tap placed behind the left ear, that works immediately but wears off in less than a minute. the borg queenThe enigmatic Borg Queen is the central locus of the Borg Collective. She brings order to the legions of voices within the Hive mind and provides a common direction — much like the queen of an insect colony. 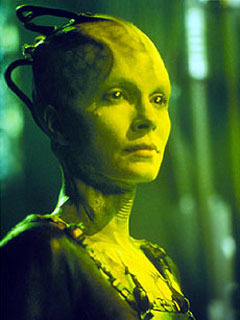 She resides primarily at Unimatrix One in the Delta Quadrant, but will often leave this home base to participate in assimilation efforts of a special nature. the borg queenhead of the borg queenThe Queen spends much of her time in her “lair” with her head and spinal column residing in a special alcove. 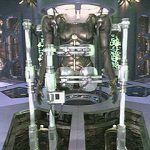 When she emerges, she will “re-assemble” herself into a predominantly artificial body — the arms, legs and torso appearing to be entirely synthetic, while the head and shoulders seeming to be organic, but with substantial cybernetic implants. 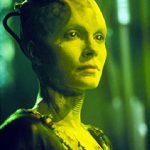 The earliest Federation data on the Borg Queen was collected by Magnus and Erin Hansen, two exo-biologists who spent several years studying the Borg in the 2350’s aboard their science vessel, the U.S.S. Raven. The Hansens were assimilated before they could transmit their findings to Starfleet, but the information was later recovered by the U.S.S. Voyager about 20 years later. The Queen “allowed” the drone Seven of Nine (who had been the daughter of the Hansens — probably the first humans ever assimilated) to be separated from the Collective by the U.S.S. Voyager, in order for her to gain experience as an individual. 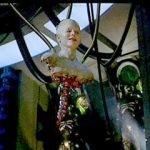 Almost two years later, in 2375, the Queen attempted to lure Seven back into the Collective — again, by having her give herself voluntarily to the goal of Borg “perfection”, while remaining an individual within the Hive. After refamiliarizing Seven with assimilation procedures during an attack upon Species 10026, the Queen ordered her to program nanoprobe viruses that would be used surreptitiously upon Species 5618 — the human race. In spite of the Queen’s seductive appeals to the former drone, Seven of Nine refused to assist in the destruction of yet another race, especially the one she had come from and was now living among. The Queen even brought in the Magnus Hansen drone to convince Seven that her “family” was the Collective. These temptations ultimately failed, and Seven was rescued by Captain Janeway and the U.S.S. Voyager, to the Queen’s chagrin. 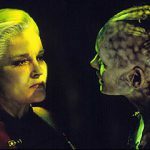 In 2376-2377, the Queen was engaged in an obsessive quest to uncover the interlink frequency that bound certain drones in a dreamstate realm called Unimatrix Zero while regenerating. She wished to terminate this realm, because in it drones were able to regain their identities as individuals, and even though they would awaken from it without any memory of the experience, the Queen considered it a threat to her control over the Hive. Thanks to intervention by Voyager, the Queen actually got her wish, but not quite how she wanted: Unimatrix Zero was shut down, but the drones who occupied it regained their individuality in the physical world and began a resistance movement to undermine the Collective. the borg queen and admiral JanewayIn 2378 the Queen once again had a fateful encounter with Voyager when a future version of Kathryn Janeway came back in time from the year 2404 with technology that could help the lost starship resist the Borg while using a Transwarp Hub as a shortcut home. The Queen was actually approached by Admiral Janeway with an “offer” — to help the Queen prevent Voyager from destroying the Transwarp Hub in exchange for the ship’s safe passage to the Alpha Quadrant. But the Queen wanted more — she wanted to assimilate the technology from the future. 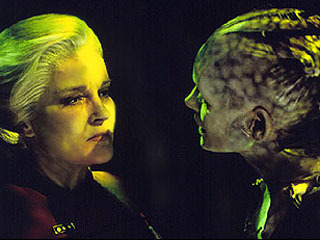 The Queen thought she had the upper hand when she attempted to assimilate the admiral, but it turns out the older Janeway was carrying a neurolytic pathogen that proceeded to infect the Collective. That pathogen brought chaos to the Collective, leading to the decapacitation of the Queen and the destruction of Unimatrix One. The extent of the damage to the Borg as a whole, and its status as a continued threat to the galaxy, remains unknown at this time.